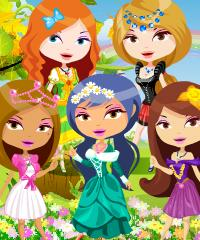 You can dress up five princesses in this amazing girl game. You just click on the question mark to start dressing up a new princess. After you have dressed them up in royal fashion style these cute little princesses, that are all so good friends, will head to the garden and enjoy the sunny day.